I was in a bit of a pickle before my recent trip to Athens for the TBEX conference. I’d set myself a strict travel budget with which to book my flight and accomodation, but was struggling to find a place to stay that would meet my needs on the budget I’d set. Sure, there were plenty of hotels that had been recommended by the conference organizers, but most of the prices started at a minimum of €75 euros a night and I wanted to stretch my money further. There were also a number of cheap rooms at the local hostels, but I didn’t really want to sleep in a shared dorm for a week. So I set myself a challenge to find a private room, preferably with my own bathroom, for €40 a night or less. After exhaustively reviewing the hotels and hostels in the area, I turned to AirBnB, a website that allows you to “rent unique accommodations from local hosts in 190 countries”. 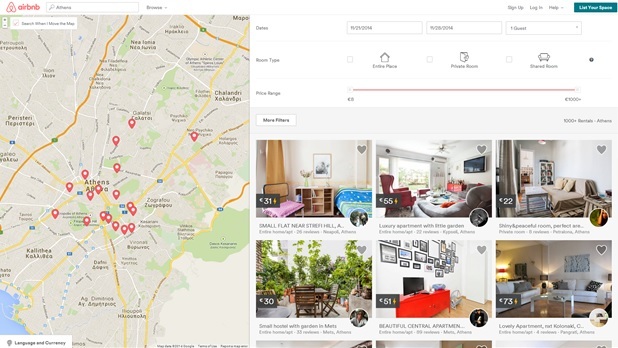 Through the site you’re able to search for private accommodation by location, price and type of property (private or shared room, entire property, etc). The prices range from budget rooms to luxurious penthouse suites and everything in-between. After a thorough search of the site, I developed a short-list of four rooms to consider. Each of the properties were in a suitable location, close to the Megaron International Conference Centre where TBEX would be held and within a few metro stops of the centre of Athens. All of the properties were also just under, or not far over, my €40 a night budget. Searching for a room on AirBnb – it took some work, but was worth it in the end. Once I’d shortlisted the four properties based on their price, location and the photos provided, it was time to dig a little deeper. 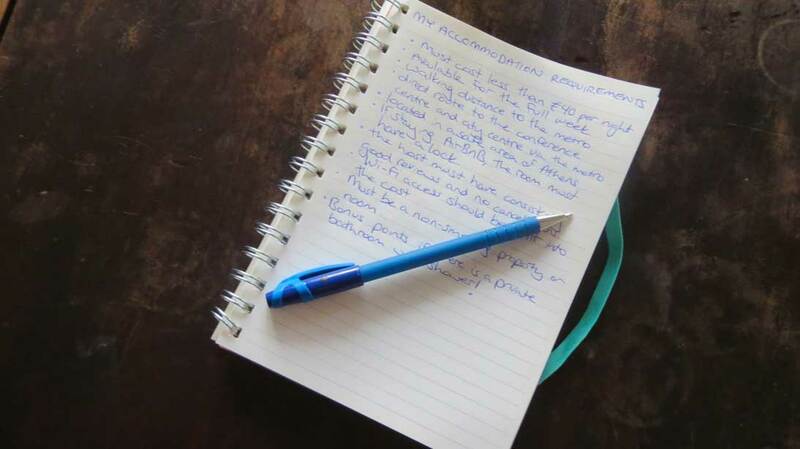 My first step was to review the feedback left by other travelers who had stayed at the accommodation. The first room was easy to review; it had no feedback, presumably because no one had previously stayed there. I decided I wasn’t interested in being the first and so stroked it off my list. The second property had a few positive reviews, but the most recent listings were automated responses from AirBnB notifying people that the last two bookings had been cancelled in advance of the stay. This property was also struck off from my list. I was starting to get a little nervous by the time I got to the third property, but was relieved when I saw the host had over 25 positive reviews. I was even happier when I noticed the room was only €23 per night and included a private bathroom. Result! • Is there a lock for the bedroom door? • How safe is the area around the apartment? (I also double checked this with a friend who is originally from Athens). • How close is the metro station to the apartment? (I checked using Google Maps but also asked in case any construction was going on which might have affected my travel arrangements). • How flexible are the arrival and departure times? (Both of my flights were in the evening but thankfully that was no problem for my host – he even came to collect me at the metro station on my arrival to make sure I didn’t get lost in the dark). With satisfactory answers to my questions, I booked the apartment. It wasn’t quite the end of my investigations though. On arrival I made sure that both my host, and the room, matched the descriptions and photos provided. Thankfully with all of the previous reviews I knew it was unlikely that the information was misleading. However, if I had arrived and things seemed unusual for whatever reason, I would have reconsidered my arrangements. It occurred to me while staying at the apartment that my travel insurance only covered me for theft in the event of a break-in with signs of forced entry. In the case of an AirBnB room, signs of forced entry would be unlikely. So, if my things were to have gone missing, I likely would have been out of luck. Fortunately, I made it through the week with all of my belongings intact. I suspect that theft in these arrangements is fairly rare, but it does happen, and it’s important to know the risks you’re taking. I was really pleased that I’d made the decision to stay in the apartment. It was the perfect price and in the right location. The room was clean and a good size. The bed and pillows were comfortable; there was a desk to work from and access to the Wi-Fi was included. I loved having my own bathroom with shower and not having to leave my room in order to use it or to wait for other people. 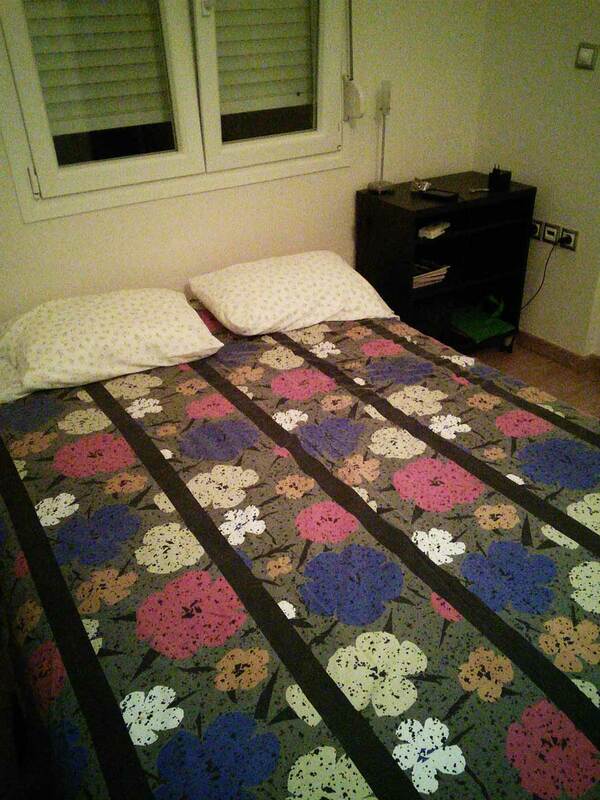 This was the bed in my AirBnB accomodation. 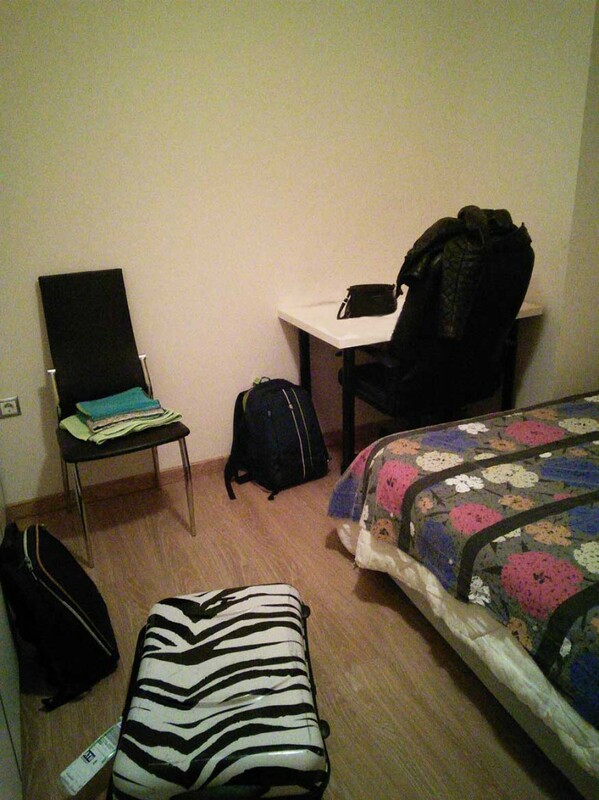 My AirBnB room also had a desk and chair, Wi-Fi and a wardrobe (not pictured). 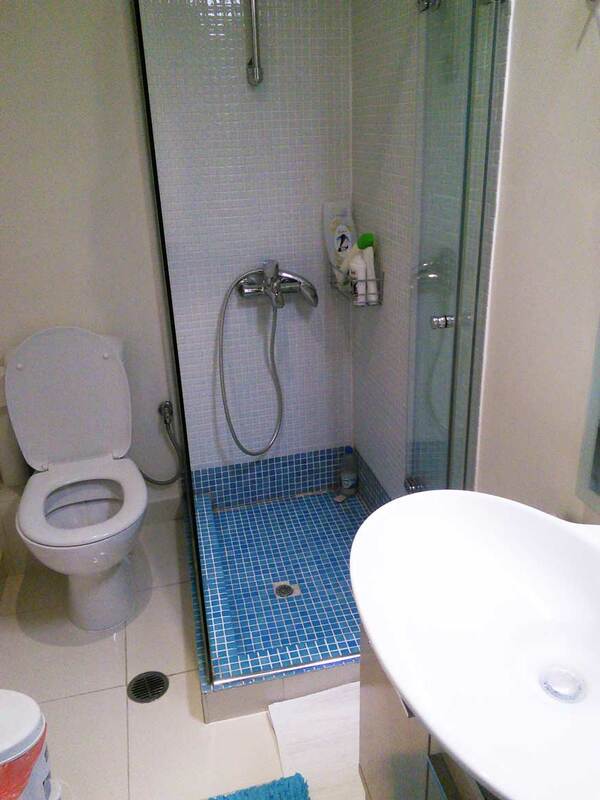 My private bathroom in my AirBnB room. My host, Nick, was great. As I mentioned before, he picked me up at the metro station to help make sure I didn’t get lost in the dark and he gave me directions to the pharmacy, grocery store and local eateries, as well as instructions on how to get to the metro (which I promptly forgot/confused, but figured out fairly quickly). I didn’t see very much of Nick during my stay, but he did check in with me mid-stay to see how my stay was going. Yes I would definitely book accommodation through AirBnB again, although I will continue to be careful with my bookings. At the end of the day, you’re trusting a stranger with your safety and the safekeeping of your belongings. The review system AirBnB has in place to rate hosts and guests certainly helps with safety and transparency, but it does not guarantee the same security that you would get in a hotel, for example. After all, AirBnB is only a platform to connect people with properties. With this in mind, I would highly recommend you only stay with hosts that have a track record of good feedback and who do not have any/many cancellation messages in their history feed. The last thing you want is to be left scrambling for new accommodation at the last moment because you have booked with an undependable host or to find yourself in a less than pleasant situation because you booked with an unverified host. With a little background research and planning, an AirBnB stay can be a great option. For my stay in Athens, it was the perfect solution! There are also some really unique places to stay – everything from houseboats to castles – so if you’re looking to try something new, I recommend you take a look! Have you ever stayed somewhere through AirBnB? How did your experience go? Do you have any tips for others who are thinking about booking? Glad you enjoyed your first AirBnB stay! I’ve tried it once when I moved back to Barcelona and was apartment searching, and had a good experience as well, so I’d definitely consider an AirBnB again in the future.